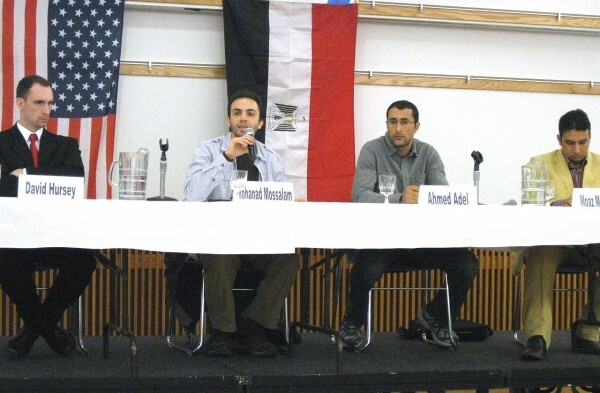 Last Wednesday in the Student Center of the Taylorsville Redwood Campus, a panel of students from SLCC and the University of Utah answered questions about the current state of affairs in Egypt. SLCC student Mohammad Ali spent 15 days setting up the panel. Mohammad is part of the CCI (Community College Initiative) program, one of the foreign exchange programs offered at the College. Mohammad started this panel after talking with a friend about how important it is for the students to be informed about the current Egyptian crisis. The panel consisted of four panelists including Ahmed Adel, Mohanad Mossalam, Moaz Mahoud and David Hursey. Having lived in Egypt, they are well versed in the current affairs. The panelists answered questions previously sent by students and also held a question and answer series. Also, Mahoud prepared a video to explain the importance of Egypt and some of their difficulties. The questions were all based on the current state of affairs in Egypt, which is facing their first revolution surprisingly started by students on Facebook. Ironically, the high turnout of people to Wednesday’s panel was owed to the spread of a Facebook invitation. Before the questions began, the panelists’ expressed their optimism about the revolution in Egypt. “Thanks for sharing [these] happy and important and upset historic moments,” Mahoud said, when asked for opening statements. Some of the most discussed points of the panel were what the revolution was exactly, how and who got it started and what the protests entailed. The revolution started due to the corruption of a 30-year presidency. The panelist described how only the people close to the President received benefits, benefits that should be reserved for all Egyptian citizens. Citizens, also called “thugs,” were denied the right to vote and the right to speak. Now that independence has been gained, questions have arisen about the beginning of a new government and what other Middle Eastern countries should do if they also want to receive independence. “Civil disobedience, no violence. If you do not follow this, you will lose moral high ground,” was the advice from Hursey to other states seeking independence. Mossalam was very adamant of the fact that Egyptians are too proud to receive help from other countries. President Obama initially supporting 30-year President Mubarak then changing his mind and wanting him out created a negative effect in the Egyptians’ minds. “The US supported the former President for 30 years. We did not want help. We said get out,” Mossalam said. Another discussion addressed Egypt’s ability to bounce back. The economy is dependent on three main things, the Suez Canal, foreign investment and tourism. The panelists are looking forward to children being able to go to school, the Suez Canal being handled differently, the population actually caring about the President and being able to find the help that they need. The panel achieved its goal of informing SLCC students and getting their thoughts and opinions out to the public. The video created by Moaz Mahoud was informative and appealed to the emotions of the crowd. The video was appropriately titled The People Won, which summed up the main point the panelist members wanted to express.